Rhino Explorer Tours & Safaris is happy to lead your dream safari in Africa to the savannah plains of Serengeti for wildebeest migration via Lake Manyara flooded by pink flamingos then descending to the Ngorongoro magical crater and the Olduvai Gorge to witness the evidence of skulls and borne of early hominids. With a warmth and friendly welcome of all her hospitality citizen, Tanzania makes a super destination for your holiday in Africa. Children policy: Minimum age allowed for participation is 12 and participating children need to be supervised is under age 13. Venice Hotel will be your accommodation one night before and after the safari. Venice Hotel is a new hotel located in Arusha town at Makao Mapya on Davos Street. The hotel has a total of 24 rooms. Facilities include satellite TV, telephone, reception, conference, 24-hour room service, restaurant, and bar. Twiga Campsite offers camping services as well as providing you with all amenities to make you feel at home. It has an extensive camping ground that can accommodate up to 100 campers where a camper can pitch a tent or park a camper. The camping site is equipped with excellent camping facilities including flush toilets, sinks and mirrors in the bathrooms, a small convenience store(supermarket), shower facilities (with hot water), camping kitchen, road access to vehicles, and an access to swimming pool and bar. During your adventure in Serengeti National Park, Seronera Campsite will be your accommodation for two nights. Seronera Campsite is a public campsite in the heart of Serengeti National Park. Simba Campsite is also a public campsite at the rim of Ngorongoro Crater. You will stay there in the camp for one night. This itinerary is good because participants will need moderate time at least two nights in Serengeti National Park compare to how large Serengeti is. So long time is the best; at least to explore adventures. You will be picked up from your hotel in Arusha by your driver guide and depart to Lake Manyara. Arrive at lunch time, game drive in Lake Manyara National Park, and overnight at Twiga Campsite. You will enjoy lunch in the village before exploring the stunning landscape of the park, looking for wildlife on the plains in the acacia woodlands and by the shores of the shallow alkaline lake. Lake Manyara is rightly famous for its tree-climbing lions, but they're far from the only highlight; by the end of an exhilarating afternoon, you could easily have spotted elephant, hippo, wildebeest, buffalo and giraffe, plus many other species. Pink-hued flamingos, one of 400 bird species recorded here, provide a splash of color. After breakfast, depart for Serengeti via Oldupai Gorge, afternoon game drive in Serengeti National Park, and overnight at Seronera Campsite. Please note that Serengeti National Park is the biggest national park in the world for the natural features and beauty of the world with the wildebeest migration, the big five animals, and great features. 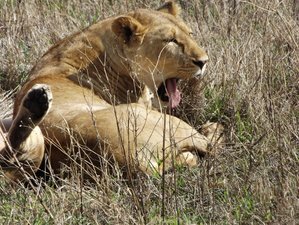 Full day game drive in Serengeti National Park and overnight at Seronera Campsite. After breakfast early morning, depart for a game drive along the Sogore River circuit, which loops into the plains south of the Seronera River. This is an adventure view for spotting lion, gazelle, tope, ostrich, and cheetah. There is a tourists center, close to public campsites, which is a well worth breathtaking after morning game drive. The center offers some interesting wildlife displays as well as a gift shop where you can purchase information leaflets and maps of the area. The Kopjes circuit going counterclockwise around the Maasai Kopjes is there for your afternoon game drive after lunch. On this tour, you have the chance to view more lion and some formidably large cobra. Depart with picnic breakfast for early morning game drive, after lunch departure to Ngorongoro Crater rim en-route game drive in Serengeti National Park, and overnight at Simba Campsite. Early in the morning, exciting sounds of Africa will raise you from your sleep. You will make the most of the day with an 8:00 a.m. start, heading off on your morning game drive. Later, the adventure will continue when you travel up to Ngorongoro, another African icon. It's almost impossible to spend too much time in Serengeti and with more than 1.5 million herbivores with thousands of predators, there's always something new and interesting to see. The changing seasons and natural light simply add to the diversity. This morning, your driver-guide will help you spot some more of the many species at Serengeti, teaching you about their fascinating habits and habitats. After a pleasant picnic lunch, it's time to drive eastwards to visit another spectacular setting for Tanzania's wildlife, the famous Ngorongoro Crater. On arrival, settle in at the campsite while a tasty, hot dinner is prepared for you. Tomorrow, the wonders of the crater await you. After breakfast, descend to the Ngorongoro Crater floor for a game drive, followed by an afternoon ascend to the crater rim for Arusha. The volcanic caldera (the world's largest) is full of grassland, a forest, and swamp, a setting of jaw-dropping beauty. Secondly, the permanent water of the crater floor supports a resident population of more than 25,000 large mammals. There, you'll find many of the reasons you chose to come on safari: elephant, lion, leopard, hyena, jackal, wallowing hippo, waterbuck, baboons, and even the rare black rhino finds shelter here. Sharing this awesome space with the animals are the Maasai, grazing their cattle in an area which has been a separate conservation area since 1956 and a UNESCO World Heritage Site since 1978. This harmonious cohabitation of man and beast makes Ngorongoro unique in Tanzania and your driver guide will be pleased to explain this incredible co-existence to you. After your morning game drive, you will have a picnic lunch in the crater before you return to Arusha. Tanzania in Africa is your definite choice to summarize your harmonious African safari. Tanzania has spectacular destinations for wildlife, beautiful bird species, stunning landscapes, evergreen forest nature, endless grassy plains, lost world and cultures of ancient Africans, precious gemstones, and pure beautiful beaches of the world. Tanzanians are good friends; hospitality and caring are in their soul blood. Truth be told, Tanzania has everything about tourism attractions. Experience a beautiful land, beautiful forest nature, and best wildlife. Different from any other oasis, Manyara National Park is lucky to have climbing tree lions unlike in Serengeti. Lions sometimes escape from buffalo and elephant attacks. There are more than 600 birds species recorded in there. Serengeti National Park includes Ngorongoro conservation area, Masai Mara reserve, and many more small private protected areas. Wildlife Serengeti has the commonest large herbivore species including 1,300,000 wildebeests, Thomson gazelles 250,000, 200,000 of zebra, 70,000 of impala, 50,000 topi, 30,000 grants gazelles, 10,000 of eland, and many envelopes just to mention few. Birdlife is highly found there. The wildebeest migration of at least two million zebras, Thomson's gazelles, and eland is dictated by local rainfall patterns of the annual cycle. The Ngorongoro Crater is 260 square kilometers in size and 610 meters deep from the rim to the crater floor. Ngorongoro is the largest crater in the world and the United Nation heritage site listed in the top natural wonders of the world. Crater, Oldupai Gorge, Maasai, and wildlife cohabitation are included in the 8,292 square kilometers of the Ngorongoro conservation area. The crater is composed of lake Magadi, Lerai Forest, hippo swamps, savannah, and green grasslands. Ngorongoro Crater is the big five territory and the fabulous stunning wild with breathtakingly landscapes not to be missed. Even the black rhino find their shelter there. During this safari, breakfast, lunch, and dinner will be provided every day. You will be also provided with two liters of drinking water every day, natural fruit, and cups of coffee. Extras at the lodges i.e. drinks, telephone, etc.